This weeks build is a slight departure from what we normally feature. Nearly all the firearms we have shown on these emails are various personal builds from employees here at Rainier Arms. The rifle we are showcasing today was built specifically for one of our local police departments here in Western Washington. 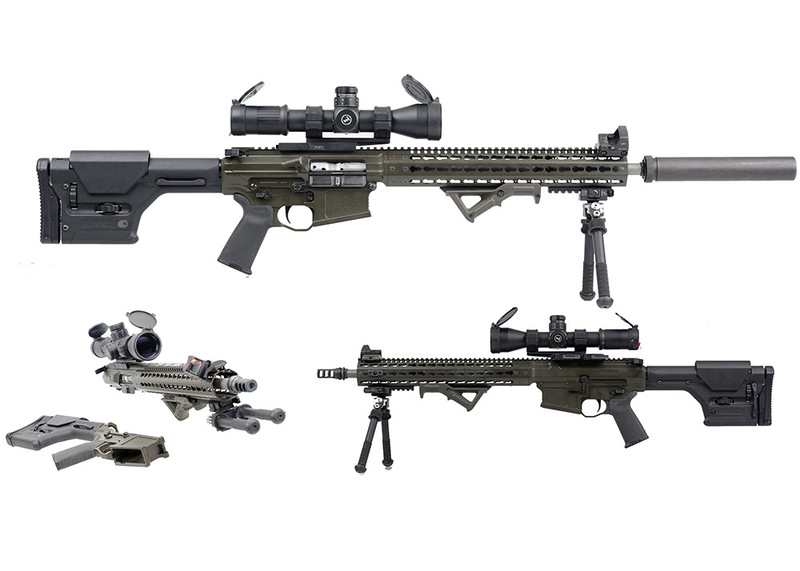 The philosophy behind the build of this rifle was something to replace the department’s bolt guns for longer range shooting that also allowed SWAT sniper teams to participate in close quarters engagements if needed. To start, the upper is built with a Mega Arms billet MKM receiver. Though it may look monolithic, the receiver portion and the rail are separate pieces but matched perfectly to exacting standards. For years, Mega Arms was one of the top selling brands moving through our shop. After a recent merger, the quality people have come to expect has continued under the ZEV brand. The construction of the billet receiver and rail is perfect for a precision rifle, increasing the rigidity while shooting. Internally, the weapon runs a 16 inch Rainier Arms Ultramatch Barrel paired with a 308 precision match grade bolt carrier. 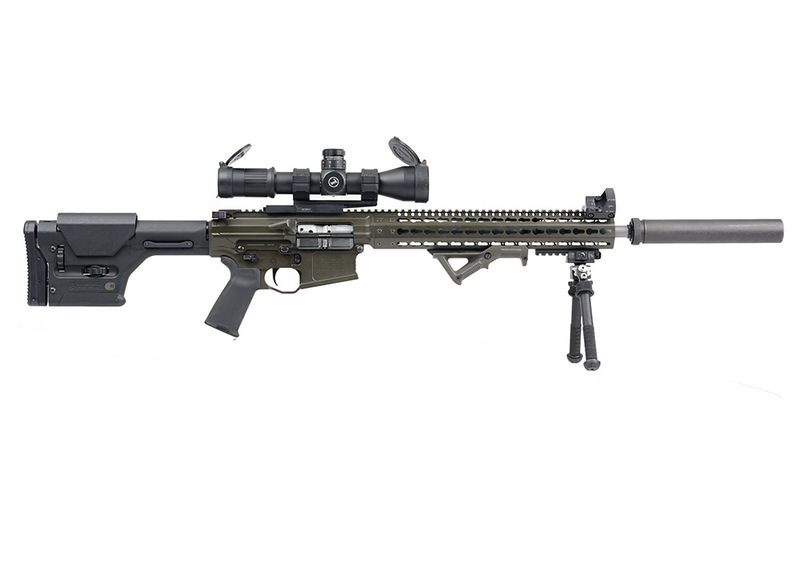 When most people build up a 308 precision rifle the most common length is usually 18 or 20 inches. While you do gain velocity with the longer length, mobility starts to decline. As stated before, the whole point of this rifle is for it to be capable of taking longer shots, BUT retain its ability to be used in close quarters. This police department in particular told us that the longest shot they have ever had to take was around 200 meters. For the .308 win cartridge, a 16 inch barrel would easily be sufficient for this task. In fact, when testing various ammunition at ranges exceeding 800 meters the rifle was still very accurate. Something that is hard to miss on this rifle is the fact that it runs with two optics. The first being the trusted Mark 6 by Leupold. The Mark 6 has been a staple for the law enforcement and military community for years and continues to live up the Leupold name. Although not featured in this build, it would be hard to not mention one of our most popular optics we sell to police and civilians alike; the Vortex Razor HD Gen II 3-18x50. When compared to the Leupold both optics are evenly matched, both in durability and ease of use. Sliding all the way to the end of the rail we have the second optic; the ubiquitous Trijicon RMR. In this case, it is the type 1, 3.25 MOA on an offset mount. 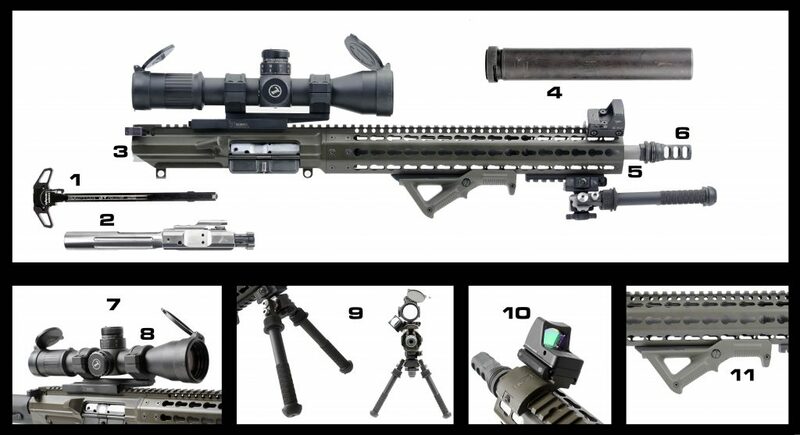 When transitioning from long range, it is quite easy to slightly cant the rifle and use the dot for close range shots that would be nearly impossible with a fully-magnified scope. Atlas Bipods are known to be some of the best on the market. They are used by both military and law enforcement and hold up to extreme abuse. This department chose to run with the PSR model since it was compact and rigid enough for the high demand of the SWAT sniper teams. The Magpul AFG has been around for awhile, yet still remains a popular option in a sea of various grips and hand stops. For this rifle, the officers wanted to have some sort of grip system on the rifle without having something that would stick out to hinder their movement in and out of vehicles or while they got to their positions. The suppressor used on the rifle is the Legacy Silencerco Specwar 7.62, a heavy duty, welded can that will stand up to high volumes of fire and offers limited point of impact shift. It is perfect for this sort of build. Moving down to the lower, things get pretty simple. 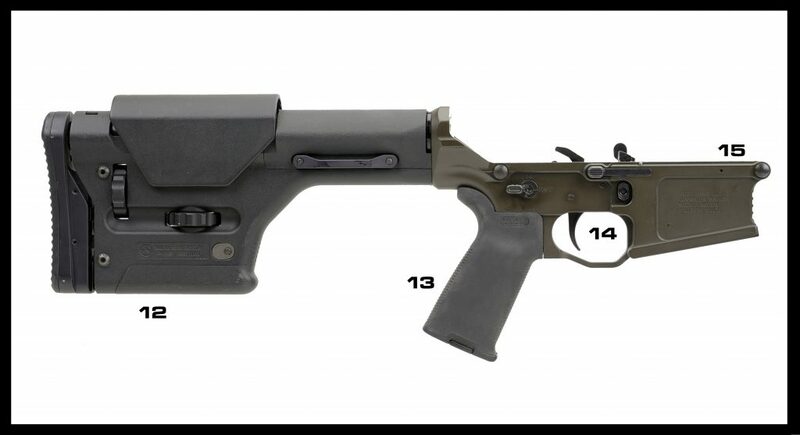 The receiver is a matched billet Mega Arms lower that pairs perfectly with the upper and the Magpul PRS stock offers a high level of stability and adjustability that you simply don’t get with a carbine type stock. The Magpul MOE + grip melds perfectly with the lower receiver and offers a comfortable grip for the shooter as well as utilizing a better grip surface if the officer’s hands get wet or sweaty. Magpul also makes a more vertical MOE K2+ grip with the same rubber overmolding. For the fire control, the rifle runs with a Hiperfire Hipertouch Elite Trigger which offers superior characteristics compared to other offerings on the market. The trigger itself was designed with designated marksman in mind, especially those in law enforcement and military units. Able to be tuned from 2.5 to 4.5 pounds, the crisp feel of the trigger and short reset allows for fast followup shots. Ultimately this rifle is a hard use precicion weapon system. It is simple, yet purpose built to take on whatever the SWAT officers might run into while out in the field. When lives are on the line, everything has to work. Each part used on this build is carefully considered and made to the highest standards possible. If you're looking to start your next build right now, be sure to check out our site. If you want to find the parts used on this weeks rifle, check them out below. Look out next week for our next build breakdown!